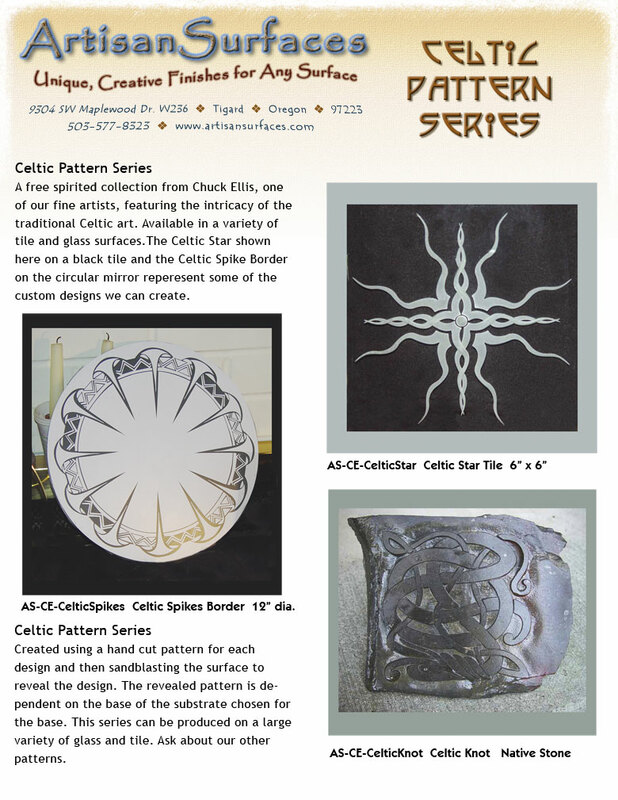 Celtic Pattern Series from Chuck Ellis, one of our fine artists, featuring intricate Celtic inspired artwork for every decorative application. Available in a variety of stone, tile and glass surfaces, in a variety of standard sizes. A complete range of tile colors is available to create a custom design unique to you. Created using a custom designed stencil for each tile and then sandblasting the surface to reveal the final design. The revealed patterns color is dependent on the base of the substrate chosen for the work. This series can be produced on a large variety of stone, glass, wood and tile surfaces. Ask about our other patterns and finishes in this series. Ask about our other pattern series and our custom design service. Deep etched designs are visually striking and 3 dimensional. Each one a unique piece of art. Crafted with materials that are guaranteed to last a lifetime and more. Any type of artwork, line art or logo can be incorporated in the piece. We can help you design a custom look for any application. The etched area can be filled with a number of different colors and materials to create exciting contrasts and even out surfaces if that is required. 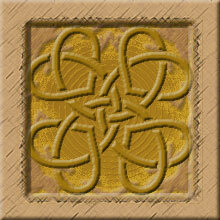 Note: The pricing for the Celtic Knot is for reproduction on native stone. A very time consuming process. Please inquire if you want the design on another material and we will quote you a price.